Cohesiveness should always carry throughout a property. Implementing the same materials throughout doesn’t just create character, but seamlessly blends each aspect even if constructed at different times during the life of the home. While transforming your backyard living space brings added value to your property and enjoyment to your family, you may come to a point where you realize you also want the front of your home to reflect that same welcoming quality. After all, the front of the home forms first impressions and is what awaits your return from work every evening. A driveway entrance does not have to include grand wrought iron gates or larger-than-life water fountains to be considered warm and inviting. Focusing on the style of the home and creating a proportionate entrance with vision and skilled craftsmanship is all that is needed to create a beautiful entryway. Whether a few minor tweaks or a complete overhaul is needed, here are our top 5 recommendations to enhance your front entrance. For those who aren’t familiar with the word portico, it is defined as a structure consisting of a roof supported by columns or piers, usually attached to a building like a porch. Not to be confused with a front porch; porches serve as an added outdoor living area whereas porticos do not share the social aspect. Adding a portico to the front entry accentuates and compliments a home, as well as serving a practical solution for protection from the elements. Because a portico is one of the first statements your home can make, it is important to talk to a professional that can lend their design expertise so everything looks suit. Don’t forget that this addition will be tied to the house, so it is also imperative to contact the right professional to draft the necessary plans and apply for the proper permits before construction starts. 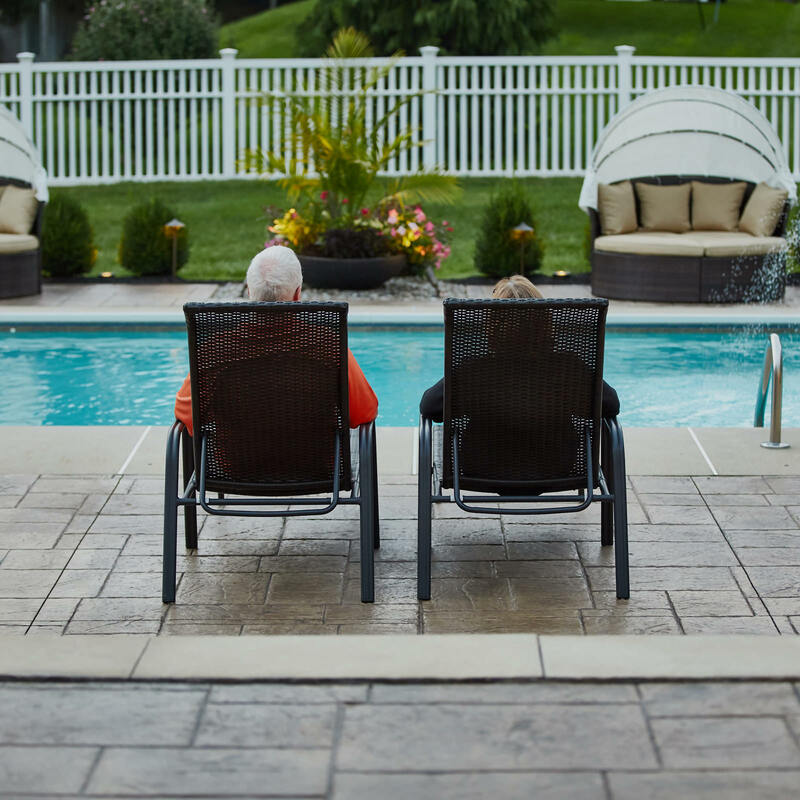 Living in a home for so long can make a homeowner blind to certain problems that may arise. Take a look at your front hardscapes, for example. If they could talk, what would they tell you? Are they chipped, cracked, lifeless, too small, not the right shape…etc? When considering updating the front of your home, it is best to have a master plan to address all of your desires, this way you have one solid plan in case of a phased approach if an all-at-once option isn’t feasible. 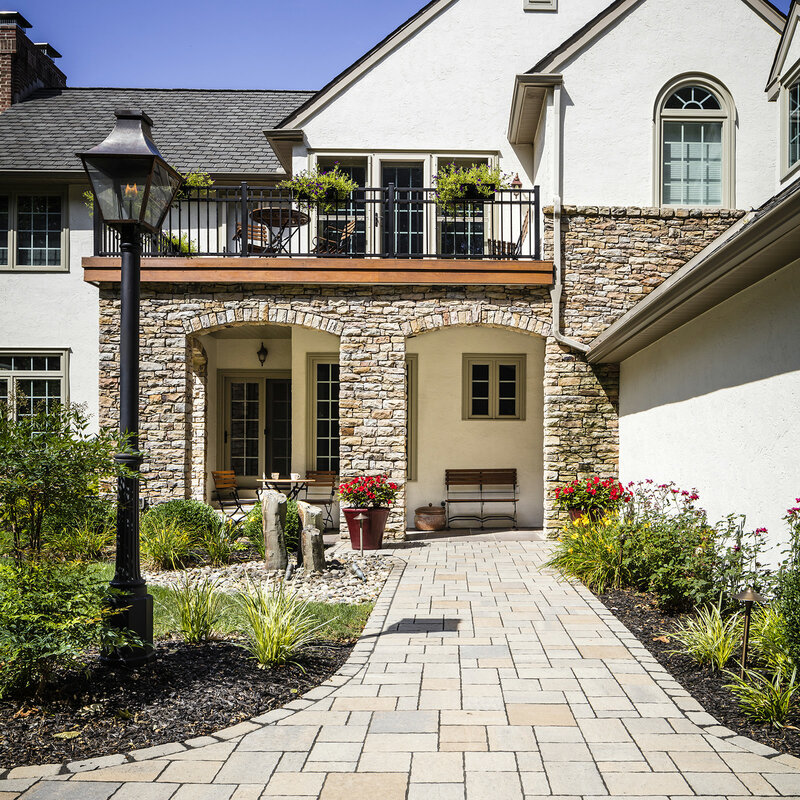 Updating an old driveway and/or walkway is a guaranteed way to give your home a facelift. Upgrading from dirt or gravel to pavers is a great example. 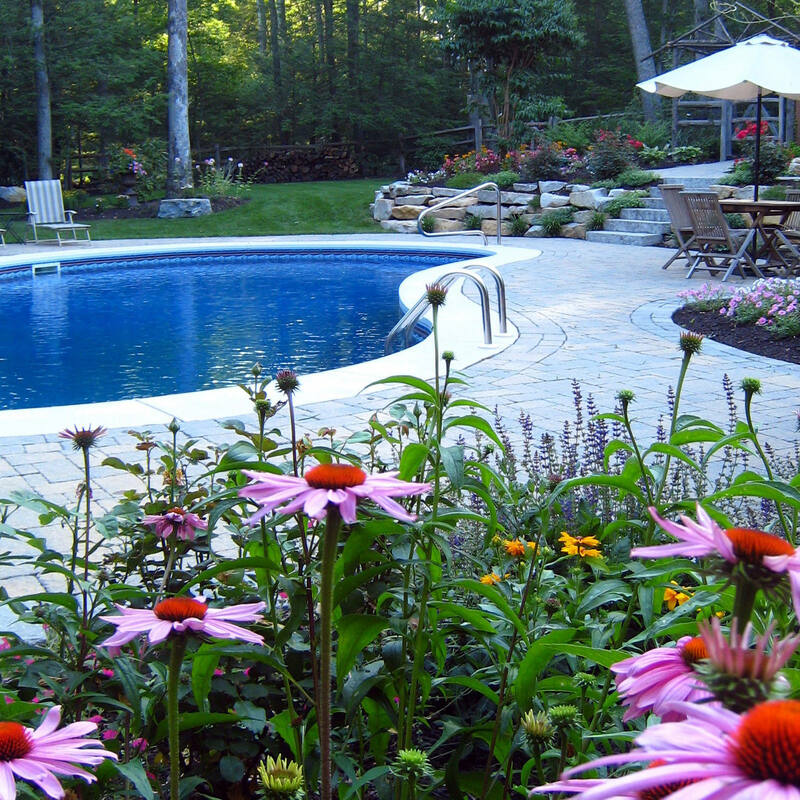 With plenty of paver, concrete and stone options, patterns, colors and textures, your designer has the liberty to be as creative as you’d like. Have a storm water issue? Consider permeable installation! Beauty and function at its finest. Lighting is a sure-fire way to bring a new warm and welcoming aesthetic to your home. There is an uneasy feeling that follows when you park in the dark, so why not light up the night? 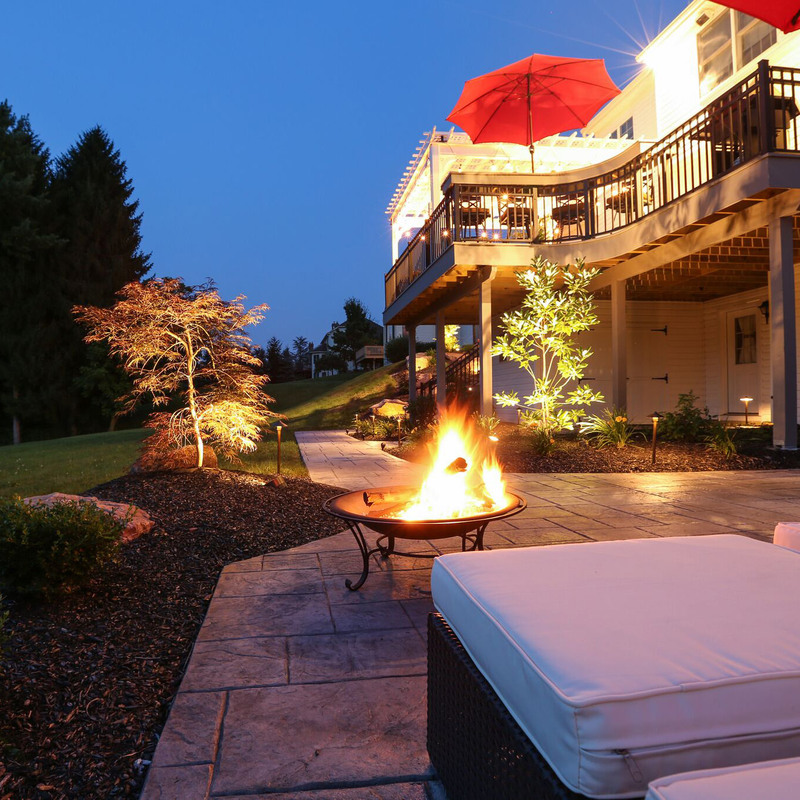 Outdoor lighting has come a long way from the traditional porch lights and hot-to-the-touch halogen lights. Low-voltage LED lighting has taken the market by storm with its energy efficiency, versatility and lifespan. Implementing LED technology into landscape lighting not only makes your footsteps safer but also gives your property an amazing ambiance when the sun sinks low. Go ahead and think outside the box when purchasing fixtures. Having a professional install fixtures like gas lamps or beautiful sconce lights will be sure to take your lighting plan to another level and add dimension to your home. What good is a cake without icing? Well, cake is always good, but it is so much better with the icing. The same can be said for a beautiful home without landscaping. 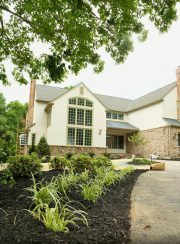 Yes, the home is beautiful, but it can be that much better with a well-thought out landscaping plan! Partnering with your landscape designer will prove fruitful when it comes to planning out the trees, shrubs and plants for the front entrance. Flowering ornamental trees, perennials and groundcovers can take a property from dull to delightful instantly! 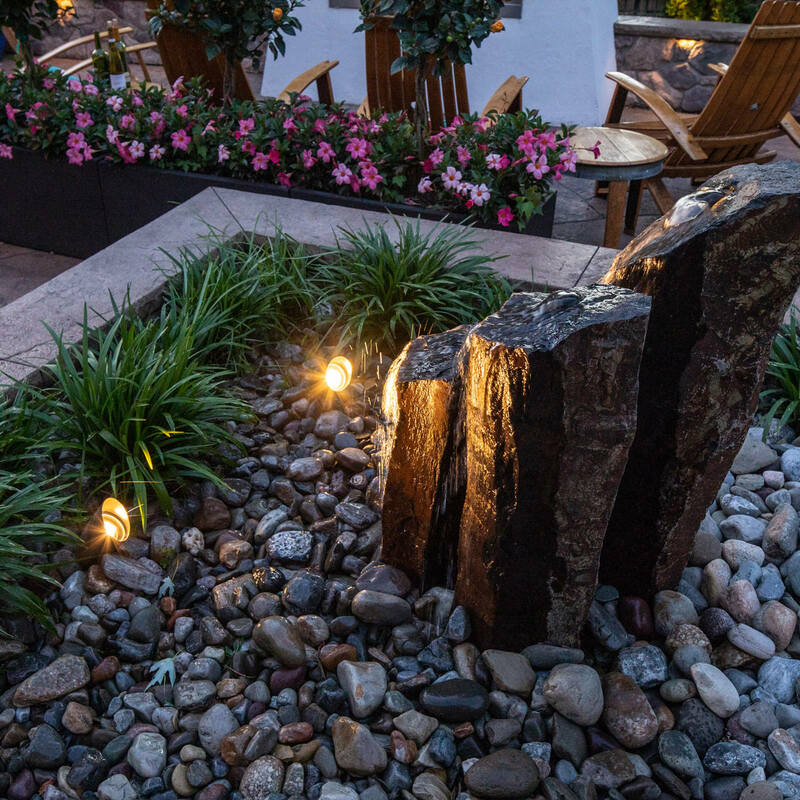 Incorporating boulders or simple water features are always a guaranteed hit to create a unique entrance that isn’t easily forgotten. The statement “less is more” has never been more true than when you are talking about entryways. Two great ways to cut down on the clutter but still make a big impact would be incorporating planters and sculptures! Introducing several planters in various sizes and coordinating colors is a great way to add personality out front. For a cleaner look, flank the door with two larger rectangular planters filled with plants like Canna, Sweet Potato Vine and Petunias. The different colors, textures and heights of these plants give the planters awesome diversity and look stunning as a symbol of welcome. You can also add a weatherproof sculpture to the front entrance to give the front of your home that little something extra. Something artistic, something classic, whether it is a compass or water sculpture, no matter what you choose, it will be sure to express your unique personality to the community. When the front entrance and backyard of the home work in concert in a harmonious flow, the feeling of unity and welcome will be undeniable. 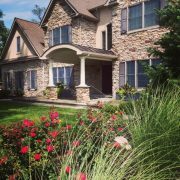 Here at MasterPLAN Landscape Design, we pride ourselves in educating our clients so they can make informed decisions in a cohesive way that benefits their property and their family! Starting with a backyard transformation for years of family enjoyment and transitioning focus to the front entrance is a great game plan. When you are ready to discover the full potential for your property, reach out to MasterPLAN! We would love to partner with you to make your property shine and your family smile!